There’s nothing in the world Army Sergeant Vic Carponti loves more than his wife and his country. Smart-mouthed and easy tempered, he takes everything as a joke . . . except his promise to come home to his wife, Nicole, for Christmas. As he prepares to leave for his latest deployment into Iraq, Vic will do everything he can to shield his beautiful, supportive wife from the realities of war . . . and from his own darkest fears. As a career army wife, Nicole Carponti knows just what to expect from her husband’s tour of duty: loneliness, relentless worry, and a seemingly endless countdown until the moment Vic walks through the door again. 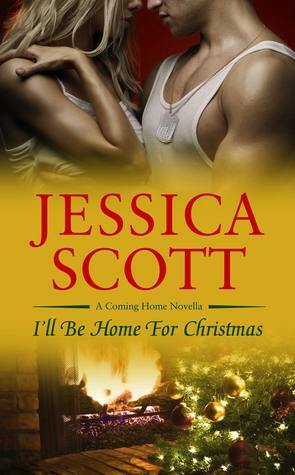 But when the unthinkable happens, Nicole and Vic’s bond is tested like never before and changes everything they believe to be true about the power of love and the simple beauty of being home for the holidays. I loved Because of you, so when I got the opportunity to read an ARC, I took it. And I am glad I read it. This was a sweet and heartwarming novella, about Vic’s and Nicole’s struggle to keep their marriage going while Vic was in Iraq. I really appreciated that Ms Scott didn’t pull any punches. She showed both the dangers in Iraq,and how it affected the troops moral. At the same time, she also show the waiting at home.For a call, for news. She also shows how marriages are impacted if you don’t call home. This was the perfect novella to whet readers appetite for Laura and Trent’s story that’s coming in Jan 2014. And it is surprisingly stand alone. My biggest complaint is that I wanted to read about how Carponti and his wife met, not get a glimpse of their life together now. It was well written, and intriguing, but I would have liked it more if it hadn’t felt like like there was an previous story I hadn’t read.